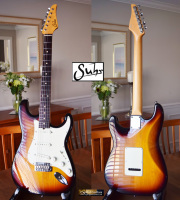 Offered is this great Strat-style guitar, a Suhr Classic S built in 2004. This is one of the highly sought-after early models, not one of the more recent Classic Pro or Classic Antique models. Even better, this example has a nice big chunky C-shaped neck profile. We sold this guitar once before a couple of years ago. 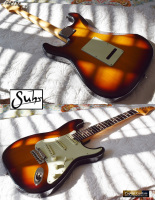 I remembered this as being a particularly nice Strat-style guitar, so I quickly purchased it again for our inventory when I saw it being offered for sale recently. 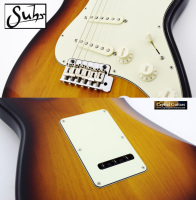 This awesome Suhr has: an Alder body with a 3-tone sunburst finish and a total weight of just 7.75 pounds; a smooth, satin-finished Maple neck with a nice chunky C-shape and depth measurements of .880" at the first fret and .960" at the twelfth fret: a gorgeous, dark Rosewood fretboard with a 9 - 14" compound radius, clay dots; a 1.650" nut and 6105 stainless steel frets; a vintage style trem bridge; Gotoh Kluson split shaft tuners; and for electronics, three Suhr V60LP single coils (6.3 ohms for the neck and middle and 7.2 ohms for the bridge) with VTT and five-way switch. 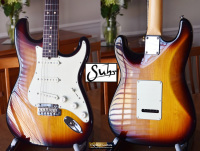 These early Suhr guitars are quite desirable because of their extremely high build quality. 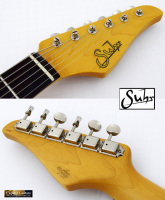 John Suhr still had a hand in the building back when this guitar was manufactured. This guitar plays effortlessly and sounds like a Strat-style guitar should, with lots of quack and clarity. 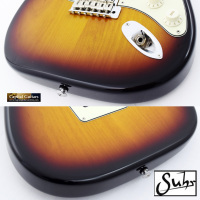 The larger neck on this guitar, a rarity for Suhr guitars, will be quite comfortable for lots of players. 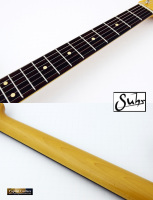 The fret work is impeccable. This guitar is in very good condition with just a couple of tiny impressions here and there, the worst of which are shown in the provided photos. The stainless steel frets remain flawless. 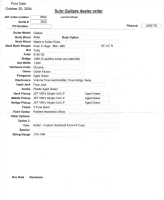 The guitar comes in it's original G&G tolex case with the trem arm, fretboard protector and spec sheet. 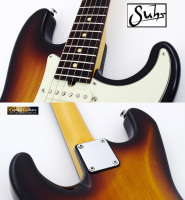 This is a particularly nice, high quality Suhr with a nice big chunky neck at a decent price. Click the 'Buy Now' button and make it yours. You will be very glad you did!